Her name means ‘time’, suggesting transience, or time’s ultimate power over all life. In the end, all life on earth is finite. Kali reminds us that we cannot wish away or ignore this simple fact. Kali is also beyond fear. As such, she is invoked by those seeking freedom from fear. Unlike other mother goddesses who give life, Kali is symbolic of one who dissolves or destroys life. She is shown at funeral pyres with jackals and goblins. Sects that revere Kali claim that by acknowledging all aspects of existence including death, fear, and destruction – rather than avoiding them – believers are liberated from existential angst and the bonds that keep them in ignorance. Today, many Westerners interpret Kali as the destroyer of the ego, viewing that as a step towards living a life free of the ego’s limitations. For many, she is also a powerful symbol of the feminine aspect, which, when ignored or denied, becomes ferocious, leading to an imbalance of cosmic energy. 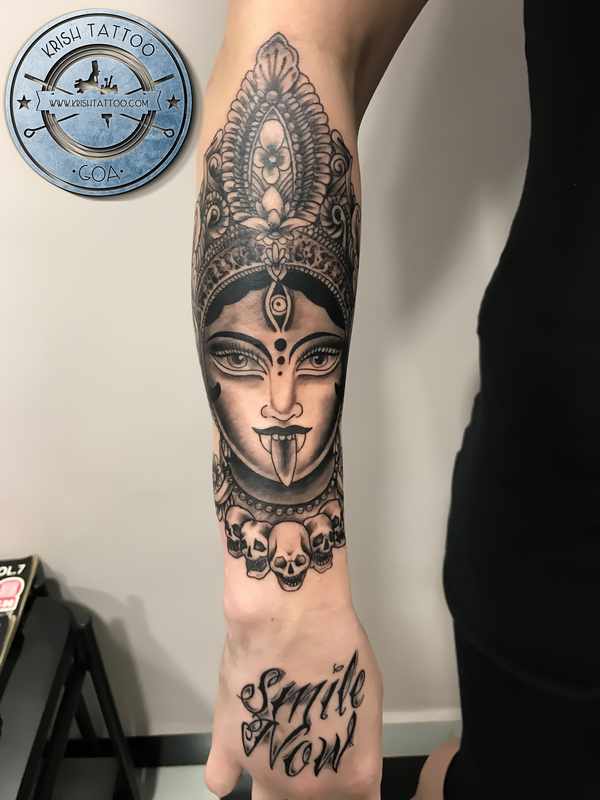 Entrenching this point of view into one’s character can be a lifelong challenge, requiring just the kind of support that a Kali tattoo might offer. In the nationalist movement of the late 19th century, Kali represented the Mother Goddess, the symbol of India. Kali appeared in the world – according to some ancient stories – as the personification of the wrath of other deities. Kali provoked Lord Shiva to such violence and destruction that the earth shook, and their dance became so wild and crazy that the very stability of the cosmos was threatened. 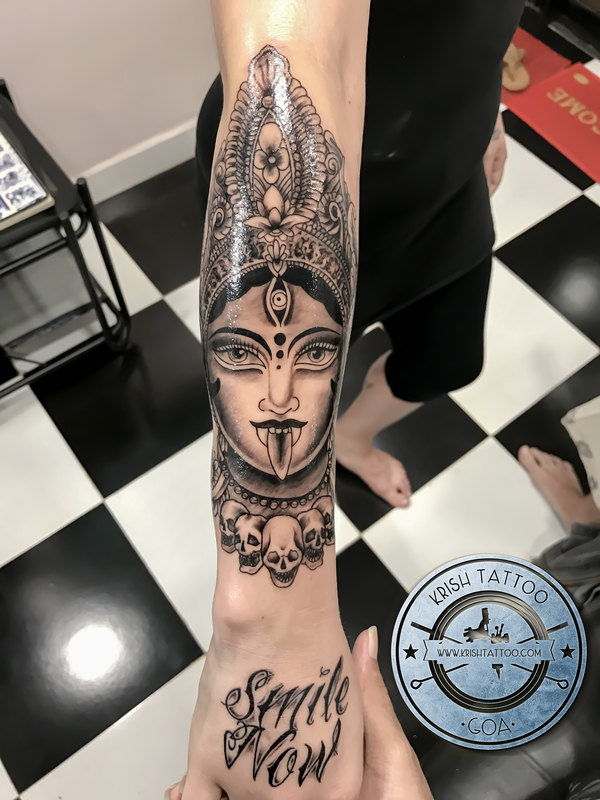 One legend tells us that Kali sprouted from Shiva’s brow so immediately blood-thirsty and out of control that Shiva had to lie at her feet to bring her to a standstill. Some Kali-worshipping sects revere her as the victor over Shiva, whereas those who revere Shiva hold him to be the only one able to calm Kali’s ferocity. The balanced view is that cosmic harmony is achieved through the union of both Shiva and Kali. Kali is responsible for a dark history of human sacrifice in parts of India, which ended under British rule. Another cult, the ‘Thuggies’, murdered and robbed in her name, and they, too, were banned by the British in the early 19th century. Kali is particularly popular in Bengal where many beautiful temples exist to honour this terrifying deity.